Is the question mark the journalist’s greatest asset? You are here: Home / marginalia / Is the question mark the journalist’s greatest asset? I thought it was the rhetorical device often compared to the handheld ordinance specifically designed for spanning through its trajectory any vertical dividing structure for detonation on the opposite exterior plane of said structure, thereby maximizing destruction and ruin in the area roughly circumscribing said opposite exterior plane and simultaneously maximizing safety and apparent diffidence of individual wielding said device. That’s good! Especially “maximizing safety and apparent diffidence”. Ha! Clever, putting that as a question—which is about the only way left for that sorry trope to function. It’s become so transparent that the reader (this reader) reflexively forms an opinion opposite that which seems to be the writer’s, based on what is being assumed in the question. And only then begins to question those assumptions. Is Lisa Miller putting that as a question to become so transparent that the reader reflexively forms an opinion opposite that which seems to be the writer’s or is she trying to bias our understanding of the issue at hand by assuming an affirmative in the very way she states the question? Is Lisa being disingenuous or does she really have a great concern for understanding how a progressive pope might not be commensurate with a 2000+ year old institution? To paraphrase that lady on the stamp: If it’s not a pilgrim Church on earth, to hell with it! “Rigid, patriarchal” – yes, that’s exactly how I would describe the post-conciliar Church. Rigid – that means no liturgical abuses, right? Patriarchical – that means no feminization of the liturgy, right? 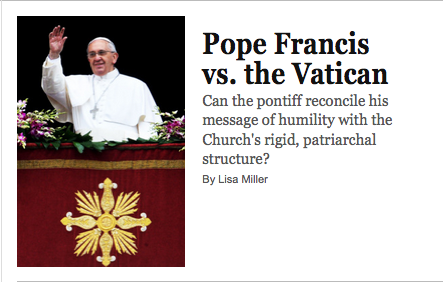 Also, “rigid/patriarchal” and “humility” are not mutually exclusive terms. In fact, one can argue that Francis’ namesake embodied these same traits: rigid when it came to the rule of his fraters, patriarchal when it came to the rule of St. Clare and her sorority, and humble in carrying out the rule in both cases. in other news…JOB, if you see this, will you check your email? 10pm Wednesday right now. Thanks.